Phoenix, Arizona – December 27, 2017 – SVN Desert Commercial Advisors recently announced the SVN year-end awards at the SVN Holiday Christmas party at the traditional American eats & craft beer brewery in Central Phoenix. As a full service commercial real estate brokerage firm, the 20 plus SVN CRE advisors cover the entire metropolitan area in Phoenix and areas across northern and southern Arizona. The Arizona “winter” months have not stopped any of these advisors in the deal-making process. They all continued to work hard throughout the entire year, but for two advisors they received the honor of recently being acknowledged for the most publicly recognized ‘Deal of the Year’ with Desert Commercial Advisors. Senior Advisor Carrick Sears and Associate Advisor, Vicente Cantua was awarded the SVN ‘Deal of the Year’ for the sale of Los Compadres Apartments in Phoenix. The property sold for $4,560,000 at a 7% cap rate. The 94,226 square foot building sale was a unique property that presented several opportunities and also a few challenges along the way. The value-add property located at 3518 W. Dunlap Avenue would give the new owners a chance to renovate the outdated units in an area of Phoenix where the rents were continually increasing year after year. The advisors, Sears and Cantua were also up against its previous history that included deferred maintenance, a master lease on the entire property which required a special property manager, and a uniquely odd layout that included condominiums that looked like part of the apartments which subsequently caused many buyers to walk away. 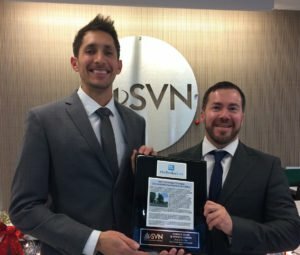 Ultimately, the SVN’s unique and nationally recognized marketing and PR platform of exposing listing details to the widest audience was the catalyst in finding new buyers to create a bidding war for the property. Through the negotiations a buyer from New York surfaced and paid full price for the multifamily property. The challenges that Sears and Cantua were one facing began to subside as a result of finding resolutions of the initial setbacks. The new renovations on the condos began that helped Los Compadres’ overall aesthetic appeal and the Phase 2 of the environmental report referencing the past gas leak that occurred in 2013 by the adjacent gas station had no impact on the property. As a an end result, the property was sold all the parties involved were happy with the sale transaction. Phoenix Ale Brewery Central Kitchen owner, Richard Stark and his staff provided excellent service to SVN and their guests. The General Manager Justin Madsen made sure all the details were in order. “Rich and his staff were so welcoming. They really went through the extra efforts to make sure everyone was taken care of throughout the event,” said Director of Marketing & Administration, Melissa Swader. While there were many other awards announced during the event, Vicente Cantua’s acknowledgements still continued. Cantua also received ‘Prospector of the Year’ for his hard work and dedication to coming into the office and putting forth the efforts in building his business. “Vicente demonstrated the tenacity and followed through in his business development goals all year long,” said Managing Director Perry Laufenberg. Carrick Sears also followed up the second year in a row by closing over $10 million in transactions for the year and is a two-time recipient in the ‘Ten-Million Dollar Club’ at SVN Desert Commercial Advisors. “We were really proud to give out so many awards this year. Our advisors work so hard for our clients and at the end of the year, it is nice to acknowledge them individually in front of their colleagues, spouses, and friends for all they do throughout the year,” said Swader. **A Special thanks goes out to the owner of Phoenix Ale Brewery Central Kitchen, Richard Stark who was so generous and made sure everything was set up perfectly for us at SVN. The Christmas party was a such success and much credit at the restaurants goes to the General Manager, Justin Madsen and our servers for the night, Miles Teenstea, Marian Cawthorn, Chris Potter. They provided excellent service throughout the evening for our guests and more thanks to the bartender and “cocktail slinger” who provided all the drinks that evening, Jeff Green. Their staff was friendly and most of all, the food was incredible. NAI Isaac Welcomes Kentucky Lions Eye Bank to Griffin Gate Plaza in Lexington, KentuckyGet Started With Your Commercial Real Estate Marketing Today!